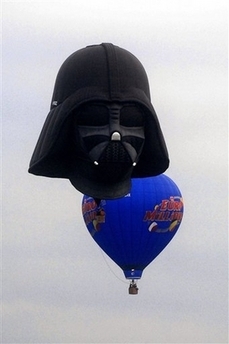 A hot air balloon in the shape of Darth Vader’s helmet takes off on its maiden flight during a hot air balloon festival in Ceroux, Belgium, Thursday, May 17, 2007 to commemorate the 30th anniversary of the ‘Star Wars’ sci-fi saga. Could you imagine just hanging out in your yard & looking up at the sky & seeing Darth Vader’s head!?! Awesome!!! It would be so cool to see that floating by overhead. omg this would be an awsome thing to see!